Very often, my “customers” asked me to retrieve records from database and pass it to them as an Excel Document. Previously, I need to manually set the width and wrap each of the columns. This macro below will automatically set all columns to auto-fit and wrap those columns that are too wide. Give the Macro a meaningful name and description. The shortcut key is optional. 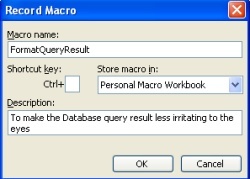 If you want to make the Macro available in any Excel in your PC, store the macro in “Personal Macro Workbook”. Click OK to continue. A small floating window will appear. Click the ‘Stop Recording’ button.